I’m extremely excited about the new systems that PhaseOne and Hasselblad announced over the last two days!!! Not so much because I hope to own one anytime soon (I’d have to sell of my kids), but because they have a CMOS censor and the changes in the market that will happen because of it. CMOS sensors will allow medium format shooters to have some of the conveniences of DSLRs, particularly clean high-ISO images, longer exposure times, and great Live View performance. This is going to have a couple of ramifications over the next year or two as far as the pro market goes. Ramifications that mean better gear, and over the long run, lower prices! Most pro photographers today seem to lean towards one extreme or another. They either want small mirrorless systems with good image quality that sacrifices a feature or two for ultra convenience, or they want a no compromise system with the highest dynamic range & resolution that their money can buy. Both Nikon & Canon just didn’t see the market for pro mirrorless cameras. Because of that, Olympus and Fuji have a runaway lead right now that doesn’t show any sign of relenting (though, they have some serious competition by way of Sony). This leaves the no compromise market. Now that there is a new 50 megapixel medium format CMOS sensor readily available to any company (you can bet your bottom dollar Sony will sell to any and everyone), Nikon could begin building an entirely new system around it. Personally, I believe this is what they should have been doing rather than working on a niche system like the Df. Since Canon prides themselves in manufacturing their own sensors, they would NEVER use one made by Sony. However, considering they are already behind as far as a match for the D800, today’s announcements will probably (read, hopefully) move them to build a body for the commercial market that is geared more towards photography and less towards video (again, high dynamic range & resolution). PhaseOne dropped the ball on pricing. 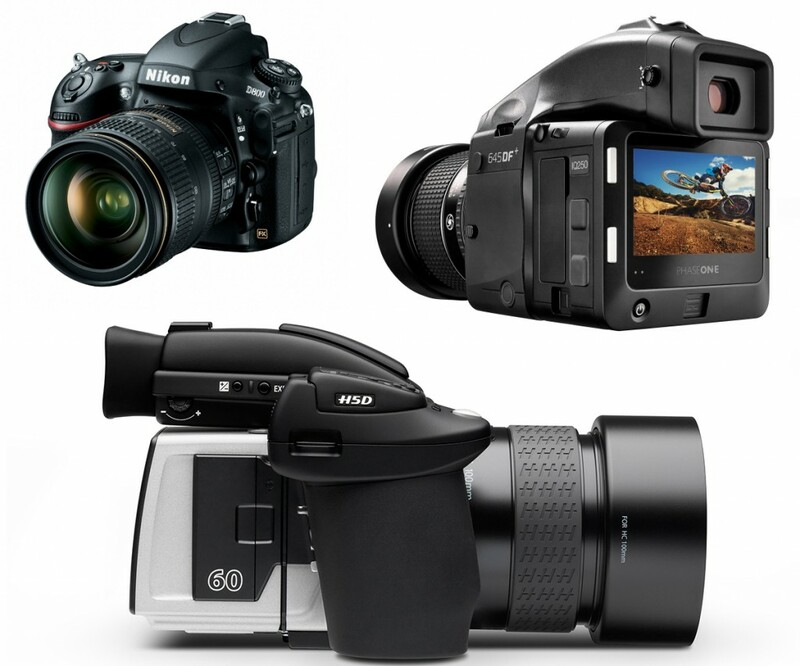 When the D800 was released, many medium format shooters with older bodies and backs decided to purchase it rather than upgrade their current system. PhaseOne could have taken the opportunity to help prevent the loss of additional customers by passing the savings of CMOS sensors on to them. 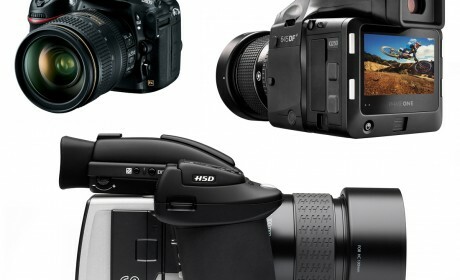 Hasselblad hasn’t announced pricing, but they will probably follow in Phase’s footsteps and do the same. If Nikon wasn’t strapped for cash they’d be able to fully capitalize on this opportunity by starting a new larger than full-frame sensor line. Basically, they could build a D4 type body with Sony’s sensor, their own Expeed image processing, extremely fast & accurate auto focus (something still sorely lacking in medium format), a larger lens mount, and a new line of very high quality glass. If they could do this and stayed under $15K for a body and one lens, they would absolutely decimate the medium format market. Alas, Nikon IS strapped for cash, and probably can’t afford the R&D required to properly build a new line. However, they can still take baby steps that will aid in acquiring more medium format shooters willing to go the high end DSLR route rather than upgrading. Getting shooters to switch systems means taking away their reasons for saying no. The lack of HIGH end glass has always been one of the biggest gripes about DSLRs by medium format shooters. True 16-bit files has been another. Nikon has already proven that it can do a LOT with a full-frame sensor. My recommendation would be a D4X around 40 megapixels that creates true 16-bit files (NOT 16-bit processing of 14-bit files) along with a partnership with Zeiss for a new line of lenses that marries Nikon’s auto focus technology with Zeiss’ optics. If you’ll notice, I haven’t mentioned Canon too many times in this post. They could do the exact same as above. There have actually been rumors of a medium format system by Canon for a while now. Their biggest hurdle is developing the sensor though. Until they do, there really isn’t a lot to talk about as far as dragging away medium format shooters…at least ones who are more interested in commercial shooting than video. I expect some new and very interesting gear to come out over the next year or two that closes the gap between medium format and DSLRs even more. This means you’ll have four companies competing in one market rather than two sets in different markets. Increased completion = better gear at lower prices!! !